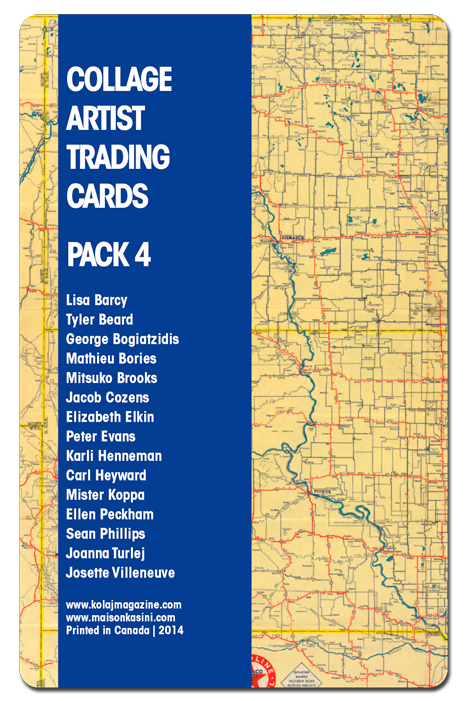 Working with the Kolaj Magazine Artist Directory, Kolaj presents the fourth pack of these curated Artist Trading Cards. 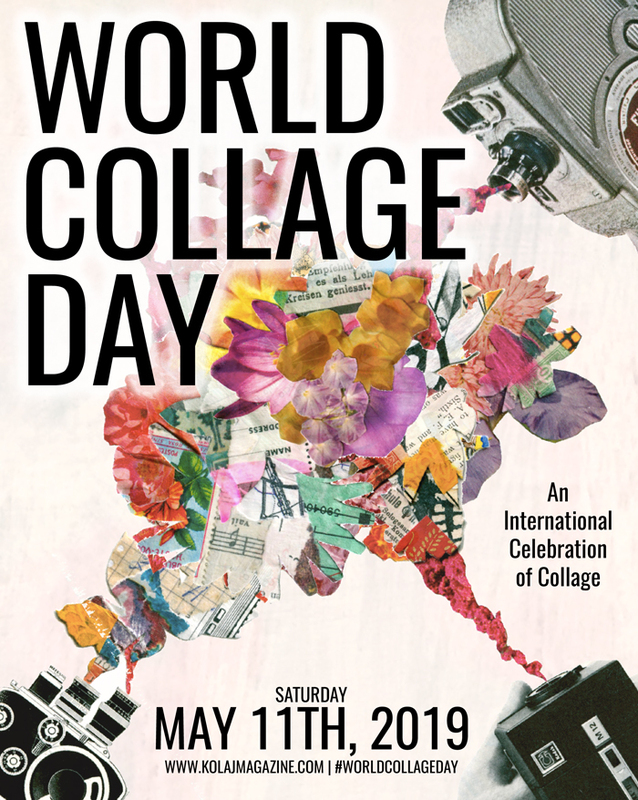 Since 2011, we have been plugged into an international community of collage artists. And with so many people doing incredible work, we decided someone needed to start treating them like the All-Stars that they are. There is no better way to commemorate an All-Star than putting them on a trading card. The idea of Collage Artist Trading Cards was born. Each card is a full colour, 5.5” x 3.5” postcard with rounded corners. 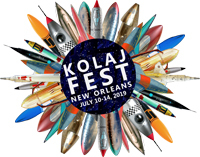 An example of an artist’s work is on the front of the card and the artist’s public contact information is on the back. 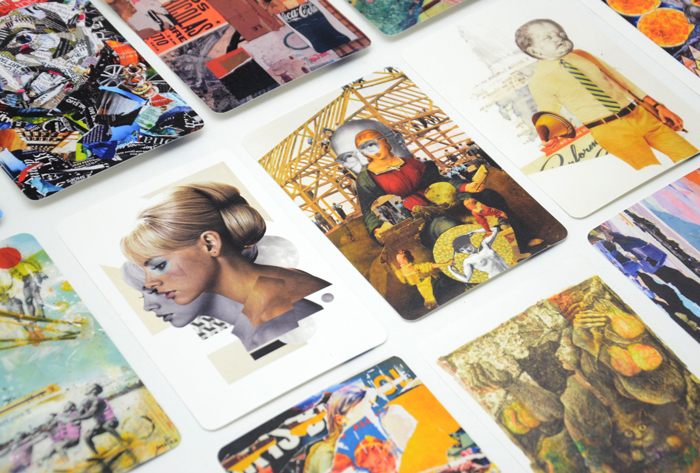 Collage Artist Trading Cards come in packs of 15. 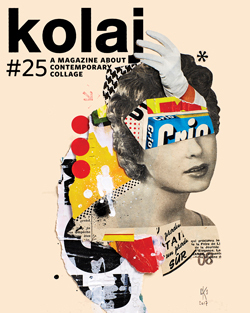 Pack Four features artists from Canada, Greece, France, the United Kingdom, and the United States, and, as always, includes a diverse selection of collage practice. You can also purchase Packs One, Two, and Three and complete the set: Collage Artist Trading Cards, Pack One, Collage Artist Trading Cards, Pack Two, Collage Artist Trading Cards, Pack Three.